MOE has made significant changes to the available vacancies for this year’s P1 Registration for 2018 students. Not only were 7 schools merged into existing schools; for the first time in the last 11 years, the total number of vacancies available (39,250) have actually fallen below the total birth rate of the cohort (39,654). Even with the addition of a new school (Fern Green Primary) with its 240 places, the shortfall in places for the full cohort is still about 404. While this appears worrying, it should be noted that the total number of resident births was 36,178 (source). Given that Singapore citizens have absolute priority over PRs and foreigners, it means that all Singaporean children will get a place in a public school, with the remaining 3,072 left over for PRs and other nationalities. The squeeze is on foreigners, which means Phase 3 is going to be even more challenging for them to get into public schools in Singapore. The tightening of immigration rules now has a significant impact on the education system in Singapore. In any case, the competition for P1 Registration this year is likely to be intense even for traditional “neighborhood schools” due to the smaller number of places available. If you are vacillating between balloting for a place in a popular school in Phase 2C vs going for your less popular 2nd choice school in Phase 2C, it is probably wiser to choose the latter for a stress-free experience. Phase 2C(S) will be very competitive this year. 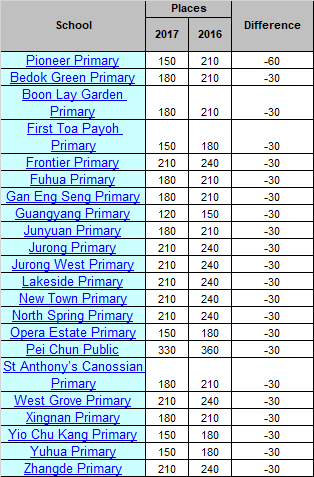 Even though priority is given to Singapore citizens, most PRs are likely to apply for the less popular schools in Phase 2C where they have a chance to get a place. If a SC attempts for and gets balloted out of a popular school in Phase 2C, he will have a lower chance of getting into his 2nd choice school in Phase 2C(S) since it may already have been filled by Phase 2C. Fern Green is, of course, a brand new school slated to open in 2018. Bendemeer and Casuarina are given one additional class each to make up for being merged with 2 other schools. 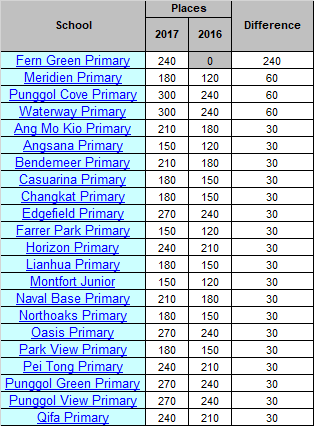 However, it is interesting that the other merged schools: Cedar, Damai, Jin Shan, Junyuan, and White Sands did not receive any additional classes. Apparently, MOE believes their existing allotment will suffice.